How long should you hold your trades? It often happens that the abundance of timeframes makes traders perplexed. On the one hand, it's possible to lose a great deal of time while checking all the timeframes. Moreover, technical analysis of different timeframes may provide confusing signals. On the other hand, a lazy trader who uses only one timeframe will likely miss something. For example, he/she won't see an important support or resistance level that would be evident if he/she gazed at a higher timeframe. Is there a solution to this conundrum? The happy middle ground? To begin with, it's important to distinguish between the so-called high/large/big timeframes (H4, D1, W1, MN) and the low/small ones (M30, M15, M5) with H1 as the borderline between these two categories. When you make a trade, it's enough to concentrate on one of these groups. The factors you need to take into account while making this choice include the time you have for trading, as well as your personal preferences and your analytical tools of choice. The thing may seem counterintuitive but the more time you can spend on trading, the smaller timeframes you will be able to use. Surprised? The picture on low timeframes changes pretty fast. As a result, to trade on them one would need to be on the constant alert. In addition, the overall number of pips gained in a single trade won't be big, so many trades throughout the day would be required to scalp profit from the market. A big number of trades, however small, requires time. If you have other daytime endeavors and can opt only for several trades a week, large timeframes should be your choice. In addition, make sure that use your personal strengths in trading because it's a truly unique resource you possess. For instance, if you have a high tolerance for stress, then you will do fine on smaller timeframes. You will be able to make a lot of trading decisions fast and enjoy the alive pulsating market. On the other hand, if your virtue is patience and you are strong in market analysis, you can do swing or position trading using bigger timeframes. To sum up, there are no good or bad timeframes. Small timeframes will let you open more trades and trade on the news. Large timeframes will help to eliminate the market noise and catch fewer but bigger moves of the price. The basic logic of different timeframes is that the bigger the timeframes is, the more weight it carries. In other words, a "Head and shoulders" pattern on the weekly chart should take priority over an uptrend on 1-hour chart. It means that you should check the bigger timeframe first and then try to figure out how the dynamics you see on smaller timeframes fits in. It's clear that a single timeframe doesn't offer enough information to enter a high-probability trade. It either focuses on too small a period of time or lacks details about the current price action. This is why multiple timeframe analysis is strongly approved by the common wisdom of Forex traders. The natural question is "How many timeframes to use"? So far, the best answer was given by the famous trader Alexander Elder who proposed a simple system of 3 screens (3 timeframes). The aim of this system is to provide traders with the logic of analyzing different timeframes and to filter the good trade signals from the bad ones. Screen #1. This is the biggest timeframe you analyze. Use this chart to determine the trend. You will open trades only in the direction of the trend on this timeframe (buy in an uptrend, sell in a downtrend). The means recommended by Elder for spotting a trend are 13 EMA and MACD for confirmation. Screen #2. This is a 1-degree smaller timeframe compared with the one used for screen #1. Here you need to find the end of correction within the general trend observed at screen #1. To do that, use an oscillator, for instance, Stochastic. 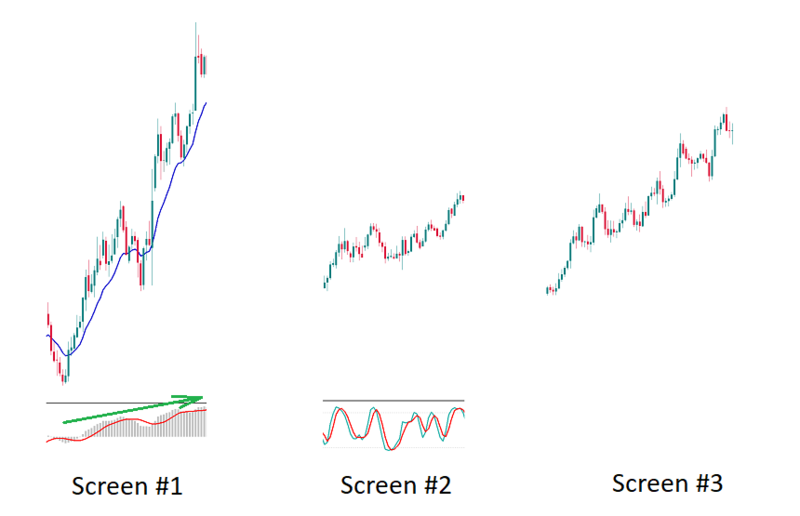 If there's an uptrend on screen #1, wait until the Stochastic Oscillator leaves the oversold area on screen #2. Screen #3. This is a 1-degree smaller timeframe compared with the one used for screen #2. It's here that you should open your trade. To make the entry as precise as possible, Elder recommends placing a Buy Stop 1-2 pips above the high of the previous candlestick to catch a breakout to the upside. If the pair goes down without triggering your order, move your Buy Stop to the area 1-2 pips above the next candlestick. The idea behind this system is actually more important than its details. The key thing is that you can use it to design a trading system of your own. No matter which tools of analysis you choose to use (price action, indicators), you need to pick 3 working timeframes (W1-D1-H4, D1-H4-H1, H4-H1-M30, or M30-M15-M5) and move from the biggest to the smallest one while analyzing the market. The fractal nature of the market leads to the fact that price action on smaller timeframes is a part of price action on bigger timeframes. If you are armed with this plan, you won't get lost and you will be able to see the market from just enough viewpoints.